One of the fun things about working on an old house is that you never know what you're going to find. This is some glass and pottery we've found while digging around in the yard. The cut glass and colored glass is really beautiful. And the old transfer ware, like the blue and white piece in the upper right corner, is particularly nice. I don't know why, but there is a lot of this old stuff about a foot or so underground. I keep waiting to find a whole plate or cup, but all we seem to get are pieces. I've found lots of bones. These bones and teeth are the most interesting and were found lodged together. When I dug these up, there was a small fang that hooked down from the right edge of the top bone. The fang dropped out though and is now lost. I dug around for other bones, but didn't see much. Have no idea what animal this was. Any thoughts? These are old square cut nails we've found when working on the house. These predate the mass produced wire nails that we use today. Large scale production of today's wire nails started around the turn of the century. These are square cut nails, made by shearing slabs of metal at a bias, and were often used in construction prior to 1900. We were walking down our street and we noticed a neighbor's olive trees. The trees still had some fruit on them, but the ground was littered with loads of black and green olives. We talked about what it would be like to cure olives. The next thing I knew, Marcia was sending out a message to our neighborhood email list asking whether anyone with an olive tree would mind if we picked the fruit. Several neighbors responded and here is the result of her effort. We are generally following the curing process described at the Milkwood site -- an Australian olive grower. There is also some great olive information available at this Caltech website . Caltech has an olive harvest coming up on November 7. I don't know how the olives are going to turn out, but they sure look nice. Oh, if you taste a raw and uncured olive be prepared for a shock. They are incredibly bitter. The San Gabriel Mountains: Our "Dominant Scenic Assets"
I've posted on this before, but I like the old panoramic views of the mountains. There is a dramatic and awe inspiring feel to these old photos. The Olmstead plan appears in the excellent book, Eden By Design: the 1930 Olmstead-Bartholmew Plan for the Los Angeles Region, by Greg Hise and William Deverell. In their book, Hise and Deverell tell the story of the Olmstead plan and its ambitious recommendations for parks and open spaces. As they explain, the plan was quickly shelved and never implemented. The story is a good one and the Olmstead plan is fascinating. In a future post, I'll take a look at East Pasadena's mountain views. We gardened this year like we never have before. Tomatoes, peppers, eggplant and cucumbers were probably the best producers. But, experiments with cantalopes and corn were fun too. The whole family got into the act -- from preparing the soil last winter to pulling the weeds to picking the vegetables. And its kind of fun toward the evening to say "let's go out and pick some tomatoes and basil for dinner." It sure seems to me like more and more people are growing their own vegetables. Marcia found a group of local gardeners who swap their extra produce and we've been able to trade for grapefruit and other fruits we don't grow. The group was profiled in an LA Times piece last week. One of the great things about playing AYSO soccer in Pasadena is that opening ceremonies are held in the Rose Bowl. This was the view as I entered the tunnel leading to the Rose Bowl field with my daughter's team -- the Lightening Lizards. Dozens of teams preceded us onto the field, each with their own banner and each with a bunch of screaming kids. As each team reaches the end of the tunnel, their team name is called, the kids go crazy and run out onto the field. The kids get to watch their pictures on the Rose Bowl's JumboTron. For me, I can't walk through that tunnel without thinking of all the great players and teams that trod that space in times past. It is amazing to live in a city that has one of the most storied and historic stadiums in the country. The AYSO program is huge. More than 3400 kids play AYSO soccer in this region, which covers Pasadena, Altadena and La Canada. We just returned from camping along the northern California coast at a wonderful state park named Patrick's Point. This is in the land of the great redwoods, damp 65 degree weather, wild blackberries and ... banana slugs. The yellow guy pictured above was making his way up the side of our tent one morning. Our campsite was on a bluff about 40 yards from the ocean. From camp we could hear the crash of the ocean. We had a couple of clear evenings when we could see sunsets from this point behind our tent. On the clear nights, the stars were incredible. We had fun at several beaches near Patrick's Point. This picture shows the beach and bay at Trinidad, which is a fishing village six miles south of Patrick's Point. A monument above the beach lists the names of locals lost at sea. On this trip we covered nearly the entire length of the state -- logging 1,900 road miles. Our kids and van both survived the trip. I'm reminded that California is an amazing place. From border to border, there is a great diversity in terrain, climate, industry, history, population and culture. And the northern coast and Patrick's Point -- simply beautiful. Our son caught this tiny mouse which was being chased by Mr. Orange, the neighbor's cat. This little guy is really fast and hard to catch. We've seen Orange and our two cats carrying rabbits, rats, lizards and moles, but this is the first time we've seen such a little mouse. It was fun to see, but our outdoor-loving son returned the mouse to nature. So here's Rhode Island Red and our Barred Rock at almost two months old. They have grown up fast. We remember when they were just days old fluff balls and then when they started getting their feathers after a couple of weeks. Hopefully in a few more months, they will start laying eggs. In the meantime, our family has had fun with the chickens. They are very much family pets. Did you know that there is an "urban chicken movement" sweeping the nation? Citizens groups in cities, such as Ann Arbor and South Portland advocate for urban chicken keeping and more lenient "chicken laws." Pasadena's own Path to Freedom has one of the best websites around. Another good one is backyard chickens. This weekend we get to enjoy the first returns from our garden. Fresh tomatoes, peppers and basil from the garden along with a little cheese and bread. It is fun to just go out in the garden and pick some fresh vegetables for dinner. Looks like we are going to have alot of tomatoes this year. I think all that prep work we did a few months ago is paying off. We had a front row seat on the curb. Great parade, every year. No question about the Grand Marshall. SMFD. Scouts, schools, veterans in uniform, jeeps, old bicycles, vintage cars, trucks, the Humane Society, churches, a priest on a motorcycle, a bubble machine, Sierra Madre City College, politicians, mail carriers, mini-cars, fire fighters, the forest service, a soft ball team, a cheer squad, and .... tractors. A wonderful small town parade. No water fights though. In past parades, fire fighters exchanged blasts of water with kids toting super soakers lining the parade route. Not this parade. I hope it comes back next year. At one time, panoramic mountain views could be had from seemingly anywhere in the San Gabriel Valley. This Watkins stereo card was made from a photo taken from L.J. 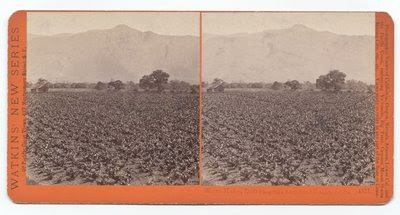 Rose's Sunny Slope ranch that covered some of present day East Pasadena (south of Foothill) and San Marino. 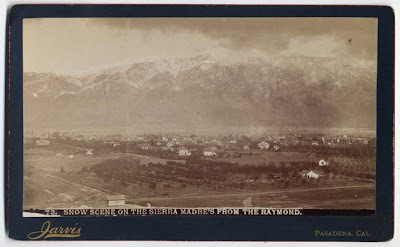 The card's title ("Sierra Madre") refers to the mountains and not the yet to be founded city. I cannot tell where in the San Gabriel valley this photo was taken. But I like it because it gives a good feel for how the mountains dominated the scene when the San Gabriel Valley was mostly open plains. Here she is. Rhode Island Red, a little older and a lot bigger than that little fluff ball she was when we got her. The chicks are constantly eating and seem to grow daily. This one was amused at her little visit outside today. She then had to return to her temporary home inside. She and five other little chicks are living in a neighbor's old rabbit cage that now dominates our living room. 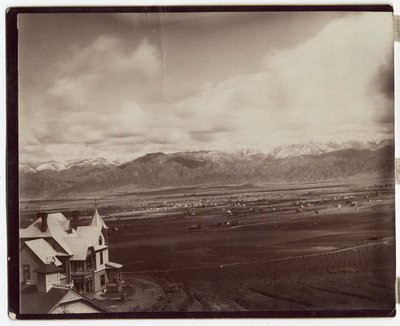 The Sierra Madre Villa Hotel got its start in 1876 and is now remembered as southern California’s first famous resort. Above, you can see the Villa’s vineyards and citrus groves, the two story hotel and Victorian Cogswell/Rhoades House all set against the Sierra Madre/San Gabriel Mountains. The hotel building was just above where the Eaton Canyon Golf Course is now and the Villa property stretched all the way down to approximately Foothill. The views from the Villa were spectacular. Visitors had sweeping views of the stirring San Gabriel Valley. In the distance, the view extended all the way to the coastline, including San Pedro and Catalina Island. It is said that Villa guests could watch steamers out at sea as they approached San Pedro. The generally well-healed Villa guests had lots to do. Nearby mountains offered hunting, fishing in the San Gabriel River, trips to Eaton Canyon or to the "grotto" in Davis Canyon that was the Villa's water source. Visitors could relax in the Villa’s gardens or stroll in its groves. Or they could enjoy their talented and gracious hosts, the Cogswell and Rhoades families. 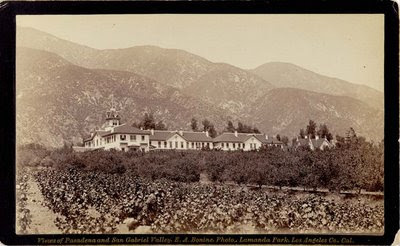 There were also nearby attractions like the Baldwin Ranch, Sunny Slope winery, Shorb winery and San Gabriel Mission. The Villa’s proprietors and beautiful setting were magnets for the rich and powerful and the Villa’s notoriety quickly grew. The eminent guest list reportedly included Gen. Ulysses S. Grant, Gen. William Sherman, Hollis P. Huntington, John L. Sullivan, Helen Hunt Jackson, the Crocker family and the Jacobs family. Other visitors, like Abbot Kinney, Charles Hastings, James Crank, and the Brigdens were guests at the Villa before buying their ranches. The Villa Hotel in 1894 and the hotel structure was torn down in 1923. Today, the Sierra Madre Villa’s name is carried on in Villa Street, Sierra Madre Villa Avenue, a namesake reservoir and the Sierra Madre Villa Metro Station. More on the Villa's history is at this excellent neighborhood website. Our ten year old spotted this striped racer snake weaving its way through a hedge next to our front porch. A quick call to Eaton Canyon Nature Center confirmed this was a striped racer. The person at the Nature Center knew all about these snakes. The Nature Center's Reptile List says striped racers eat lizards, rodents and small birds and are common in oak woodlands, chaparral areas and washes. California Herps has some great striped racer pictures and says these snakes have acute vision, are fast moving, alert and difficult to get close to. They climb vegetation and seek shelter in burrows, rocks or wood piles. I am continually amazed at how much our kids see that we miss. A lot around here is named Sierra Madre – there’s the city to our east, and Sierra Madre Blvd., Sierra Madre Villa Ave., and the Sierra Madre Villa Metro Station. But, I always wondered why we had so many things named Sierra Madre when our local mountains are the San Gabriel Mountains. 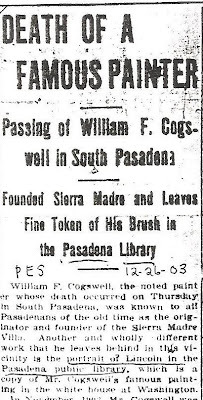 It turns out that the mountains have gone by both names, with the officials favoring San Gabriel Mountains (named after the mission) and many locals preferring the name Sierra Madre. As the Field Guide to the San Gabriel Mountains points out, in 1927 the U.S. Board on Geographic Names ended the controversy and ruled the mountains would be officially known as the San Gabriels. I like where J.W. 's coming from. The house is filled with chirping again and we have six tiny chicks in an old rabbit cage in the living room. This is Rhode Island Red, three days old.